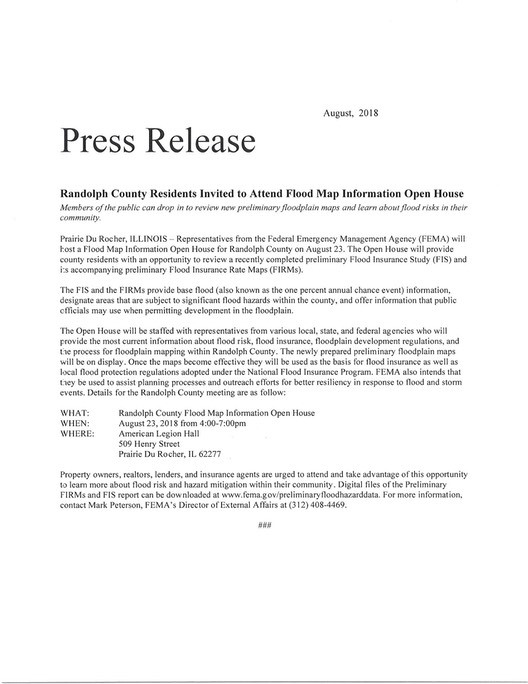 Attached is a press release issued by FEMA letting you know about the public meeting that has been set up in Prairie du Rocher for next week, August 23rd at the Legion from 4-7 p.m. The meeting will outline what can be expected with the redrawing of the flood maps and what it will mean to residents of Prairie du Rocher to no longer be under the protection of a certified levee. This is the outcome we worked hard to avoid, but in the end, were unable to meet the deadlines because of the scope and expense of the changes that are being required. Meanwhile, our Steering Committee continues to work on ways to regain our certification at some point in the future. Know that although the current news is not what we want, we will not give up on our efforts to regain the status we need.